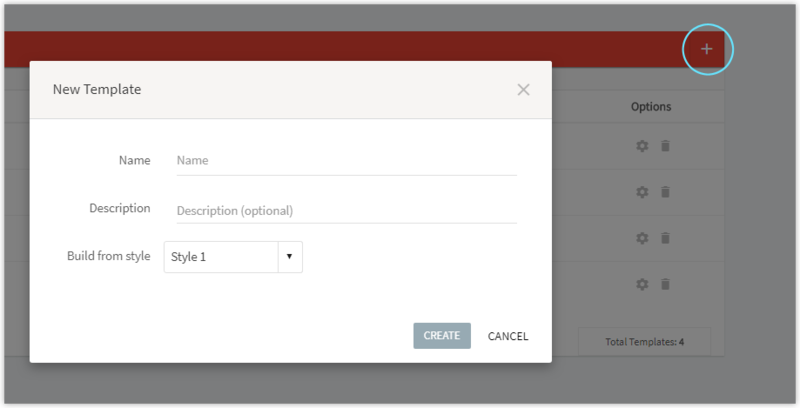 Canvasflow supports the use of unlimited templates, each of which can be used to help streamline the creation of new articles. Because templates are only used to define the the layout and initial content of an article, the 'style' or 'design' associated with the template must be set independently. This provides complete flexibility if design changes need to be made in the future. From the 'Template Manager', click the 'add template' button at the top right. Give your template a name and (optionally) a description. Select the style you wish to apply to the template. The associated style can be changed at any time from within the 'Template Manager' or 'Template builder'. The new template will be created and appear in the template manager list. This template will now appear as an option when creating a new article. It's also possible to create a template from an existing article, more information can be found in our Creatr a template from an article document.